In Asia, Japan +0.1%. Hong Kong -0.9%. China -1.6%. India +0.1%. In Europe, at midday, London +0.1%. Paris +0.7%. Frankfurt +0.3%. Futures at 6:20, Dow +0.1%. S&P +0.1%. Nasdaq +0.1%. Crude -0.9% to $64.04. Gold -0.5% to $1307.90. Bitcoin -3.1% to $5067. 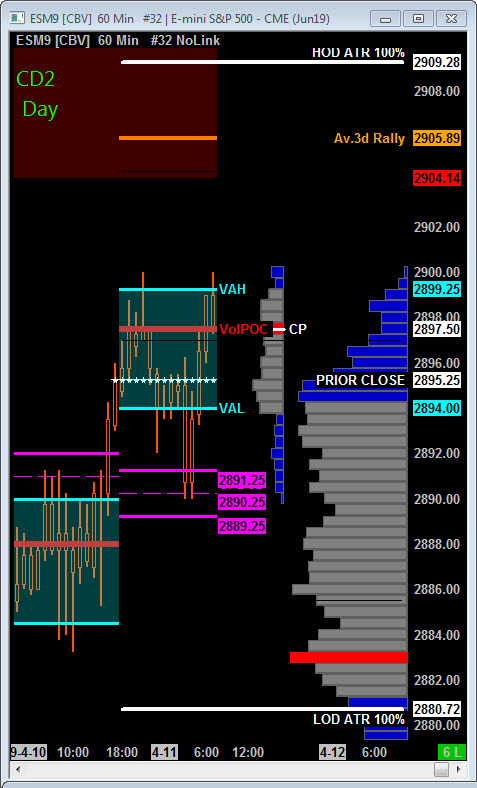 Today is Cycle Day 2 (CD2)…Price pulled back during overnight trade and found responsive buyers with 3 Day Central Pivot Zone (2889.25 – 2891.25). Next objective is for bulls to convert 2900 Roundie to solid upper support to continue the current cycle rally targeting 2908.50. Scenario 1: IF Bulls hold bid above 2890, THEN initial upside potential targets 2902 – 2906 3 Day Cycle Penetration Zone. Scenario 2: IF Bears hold offer below 2890, THEN initial downside objective targets 2885 – 2880 zone. 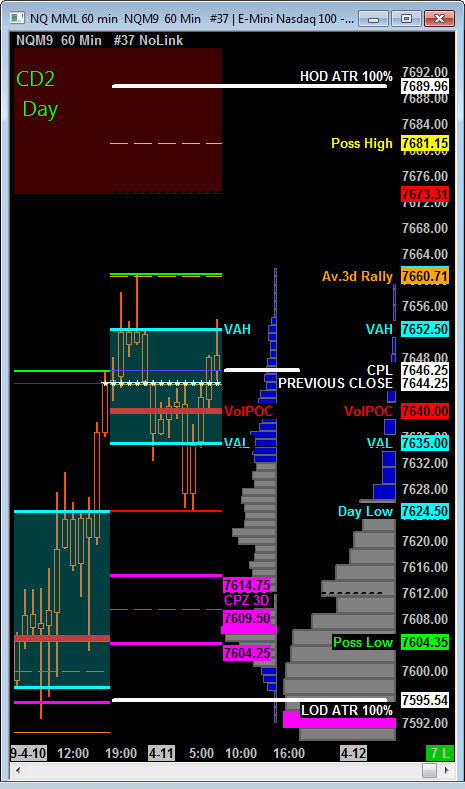 Today is Cycle Day 2 (CD2)…Price pulled back during overnight trade finding buy response at 7625 prior Value Area High. 3 Day Cycle objective (7660) has been fulfilled, so next objective is to convert this level to upper support to continue this cycle’s rally targeting 7667 – 7681 zone. Scenario 1: IF Bulls hold bid above 7625, THEN initial upside potential targets 7668 – 7681 CD2 Penetration Zone. Scenario 2: IF Bears hold offer below 7625, THEN initial downside objective targets 7615 – 7605 3 Day Central Pivot Zone.